Belgian prosecutors have charged a man with terrorist offences, in relation to the deadly attacks in Brussels that left 31 dead. They named him as Faycal C, who was arrested on Thursday. 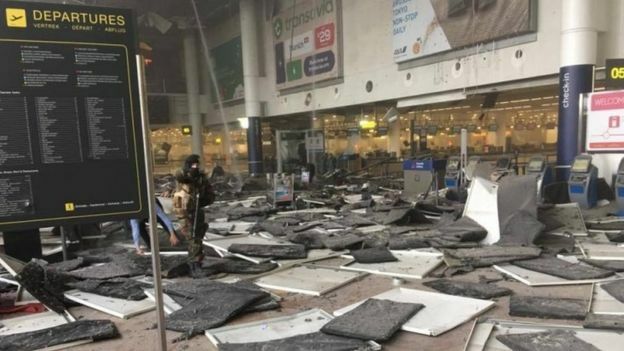 Suicide bombings, claimed by so-called Islamic State (IS), killed 11 people at Zaventem airport on 22 March, while 20 people died in an attack on the metro. Zaventem – Brussels international airport – will not reopen before Tuesday, authorities have announced. Belgian prosecutors said that Faycal C had been detained outside the prosecutor’s office in Brussels on Thursday. A search of his home had found no weapons, a statement said. It said Faycal C was charged with “participation in the activities of a terrorist group, terrorist murders and attempted terrorist murders”. It gave no further details and made no comment on Belgian media reports that he was the third man in an airport CCTV image that showed the two suicide bombers – Najim Laachraoui on the left, and Brahim el-Bakraoui. 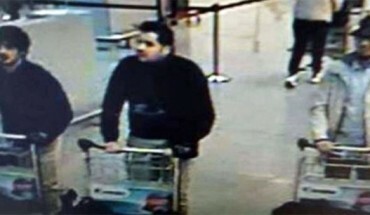 Belgian media say the third man is Faycal Cheffou, a freelance journalist. 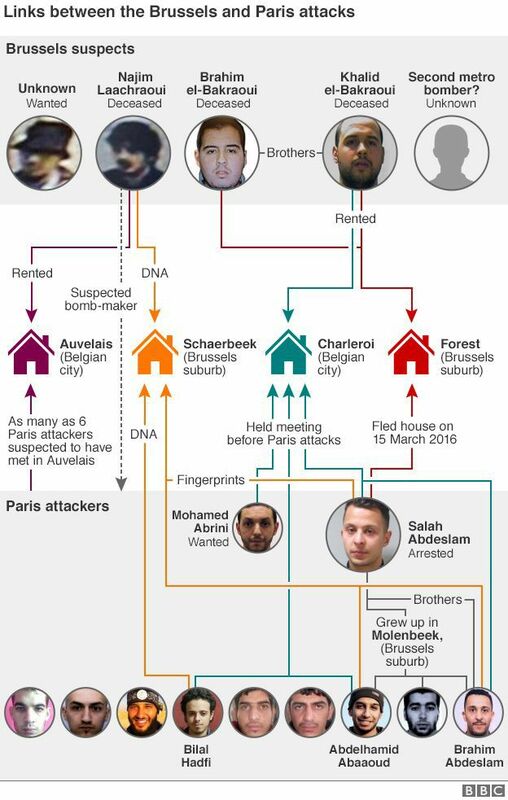 Brahim’s brother, Khalid el-Bakraoui, carried out the Maelbeek metro attack. Faycal C was among 12 people arrested on Thursday and Friday in police raids in Belgium, France and Germany. Four days before the Brussels attacks, the key suspect in the 13 November Paris attacks which killed 130 people, Salah Abdeslam, was detained in a raid in Brussels. Police said he was initially co-operative. But Belgian Justice Minister Koen Geens later confirmed in parliament that Abdeslam “no longer wants to talk since [Tuesday’s] attacks” in Brussels. Separately, Brussels airport authorities said the “investigative work related to the judicial inquiry into the airport terminal has been completed” but that passenger activity could not resume before Tuesday. A team of airport engineers and technicians is being given access to the terminal building for the first time since the attack. They will assess the damage and stability of the building. The airport authorities will also install new security measures. The airport check-in area suffered severe damage when two blasts seconds apart hit opposite ends of the departures hall. But prosecutors denied the murder of a security official at the Fleurus nuclear research centre was a terrorist act, the Belga news agency reported. Didier Prospero was found dead in his bathroom by his children on Thursday in the town of Froidchapelle. He had been shot four times and his dog was also killed. Belga quoted the Charleroi prosecutor’s office as also denying media reports that Mr Prospero’s security access badge had been stolen. The prosecutor said criminal investigators and not terrorism specialists were investigating. The Belgian government has come in for criticism that it did not do enough to prevent the attacks. Two minister offered to resign after Turkey said it had alerted Belgium about Brahim el-Bakraoui, before deporting him. French President Francois Hollande insisted on Friday that the jihadist network that hit both Paris and Brussels was being “destroyed” but cautioned that threats remained. In his weekly address on Saturday, US President Barack Obama paid his respects to the victims, including the two Americans killed and the 14 injured. He praised the contribution of Muslim-Americans to US society, saying: “We have to reject any attempt to stigmatise Muslim-Americans. “Such attempts are contrary to our character, to our values, and to our history as a nation built around the idea of religious freedom. It’s also counterproductive. Meanwhile, US singer Mariah Carey has cancelled her concert, scheduled for Brussels on Sunday, citing security concerns. More details of those killed in the Brussels attacks have been released. Nationals of 40 countries were caught up in the attacks.